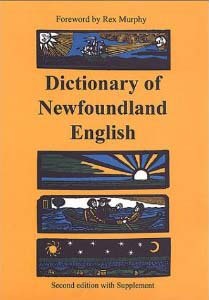 The Dictionary of Newfoundland English is a historical dictionary that gives the definitions, pronunciations, and variant spellings of words that are unique to Newfoundland and coastal Labrador, or have special meanings in the region. It also illustrates how phrases and words have evolved over time and are used in the language today. The DNE cites quotations from published sources (the earliest of which date back to the 16th century), and from interviews with Newfoundland speakers, most of which were recorded between the 1950s and 1980s. The vocabulary documented in the DNE belongs to one of the oldest overseas communities of the English-speaking world. Newfoundland English has its roots in the 16th and 17th centuries, when English fishers visited the island each spring and summer to catch cod and other fish. The annual migratory fishery gradually gave way to a resident industry between the 18th and 19th centuries as English-speaking settlers arrived from southeast Ireland and southwest England. Newfoundland English evolved as these settlers and their descendents came into language contact with Aboriginal groups in the region, as well as with residents of the Canadian North and along the Atlantic seaboard between Nova Scotia and New England. After decades of research beginning in the 1950s, editors G.M. Story, W.J. Kirwin, and J.D.A. Widdowson published the first edition of the dictionary in 1982 to tremendous popular success and widespread critical acclaim. They released a second edition in 1990 that included a Supplement containing approximately 1,500 new words and expanded entries. An online edition of the DNE became available in 1998.